Warde’s Jeff Seganos Jr. shoots during the Fairfield Prep Holiday Classic on Dec. 28 at Fairfield University. There was a time when Fairfield Warde boys basketball coach Ryan Swaller would have done just about anything for the Mustangs to qualify for the FCIAC tournament. Times have changed and for the past three seasons Warde finished in the league’s top eight. The problem is the Mustangs are 0-3 in those quarterfinal games, meaning the next step for Swaller and the Mustangs is making the semifinals. “For us to make it and win a first-round game on our court would be huge, but you have to get there first,” Swaller said Monday. 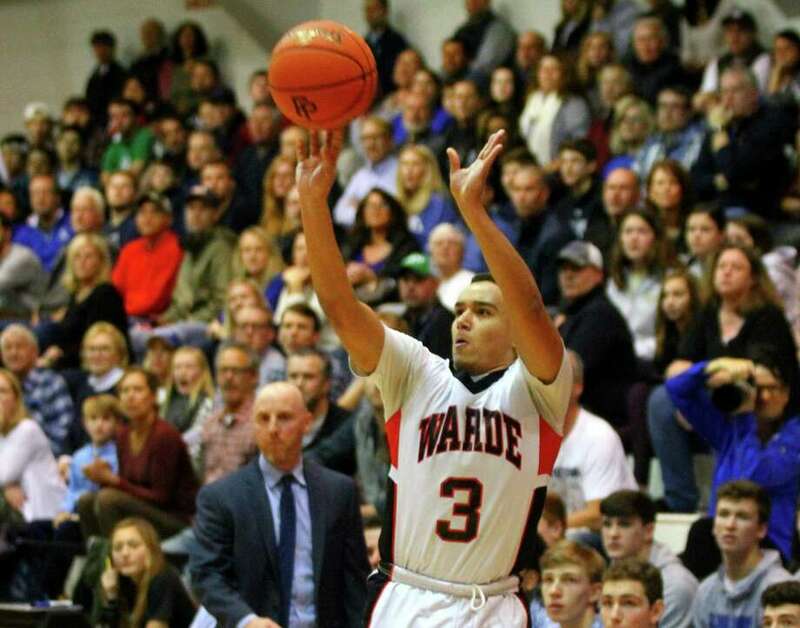 And to get to the FCIAC playoffs, Warde (6-4, 4-3) needs to finish strong against its tricky back-half schedule that continues Friday night at home against Danbury. In all, five of the Mustang’s final eight games are on the road, although Warde hosts one-loss Trumbull on Feb. 5. A commitment to defense has played an important role in the Mustangs success, as they’ve held opponents under 50 points in four of their victories. A 79-62 loss to Wilton on Jan. 17 is the only time Warde’s allowed over 60 points. Some of that toughness comes courtesy of players like Jeff Seganos Jr., Joey Gulbin and Jack McKenna — all members of the Warde football team. This season the Mustangs run, at times, 12-13 players deep. A similarity across the roster is that many of the Warde players continue to play other sports, rather than focusing on basketball. Swaller thinks this allows them to embrace whatever role he offers them in a given game. Buying into the team mentality has resulted in a close-knit group. The role of go-to scorer for the Mustangs falls to 6-foot-6 senior guard Matt Becker, who leads the team at 14 points per game along with 10 rebounds per game and 3 assists per game. He’s stepped into a new role following the graduation of FCIAC Player of the Year Sean Conway, who averaged over 30 points per game last year. Helping Becker are junior Brendan McMahon (12.2 ppg) and senior Matt Houghton (11). Eli Feay and Nick Crescione, meanwhile, continue to contribute defensively.